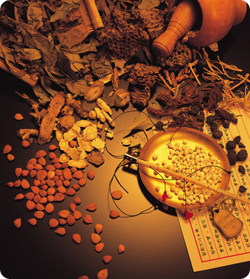 Traditional Chinese Herbal Medicine consists of 5,767 substances derived from plant, animal, and mineral sources. The use of these substances can be traced back to 1,000 BC. Over the past 3000 years, an incredibly rich and powerful system has medicine has been created. During this time, classical herbal formulas that are effective for many health concerns have been developed. The herbs are available in the form of herbal teas, liquid extracts, tablets, capsules, granules, lotions, creams, salves, or poultices. At Dunamis Acupuncture & Herb Clinic, we use many of these forms of herbs. Individual substances are rarely prescribed alone in Traditional Chinese Medicine. A carefully balanced recipe of several different herbs is specifically tailored for each person's entire health condition. Each herb is chosen for its own specific functions. In addition, herbs can enhance the strengths and reduce the side effects of each other. The combination of substances in a formula creates a new therapeutic agent that can treat much more effectively and completely that a single substance. What is the difference between Western Herbs and Chinese Herbs? Western Herbal Medicine tends to use one or two herbs to treat just a specific symptom. A Chinese Herbal formula has as many as 20 different herbs. The herbs are selected to work synergistically to treat the whole person. In Chinese medicine, due to our diagnostic system, we are able to assess a persons whole constitution (the health of their whole body) and treat the root (or cause) of a health concern along with a branch (or the symptoms) of a health concern. It is in this way that we are able to treat a person's whole body and mind, rather than just a symptom.